UM Motorcycles has opened its tenth dealership in India in Bengaluru. To be called, Bengaluru UM, the new dealership is situated on Sarjapur Road, Bengaluru. Spread over an area of approx. 2400 sq ft, the dealership facility has a showroom integrated with an after-sales service facility to ensure that the customers receive best-in-class pre-and post-sales ownership experience. Madhuri Mudhol, Proprietor Bengaluru UM said “UM Motorcycles are considered among the most coveted Cruiser brands in America and we are fully committed to this partnership and look forward to an exciting time ahead. Working with UM Motorcycles in Bengaluru will be an enriching experience that will enable both partners to grow.UM Bengaluru has engaged professionally trained staff for the management of sales and after sales, to ensure best in class customer service for both pre-and post sales ownership experience. 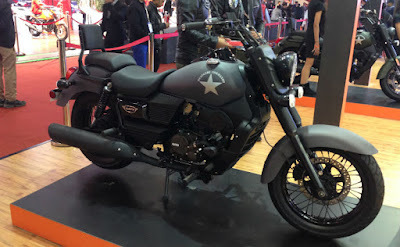 The Renegade Commando is a low-slung cruiser powered by a high powered 280 cc Engine with 25 BHP at 8,500 rpm and 21.8 Nm of torque at 7,000 rpm, mated to a six-speed transmission. This lightweight machine has a 200 mm ground clearance and an inbuilt USB charging point. The front disc brakes improve the braking efficiency drastically while radiation increases the engine efficiency. The bike comes with wide handlebars and hydraulic telescopic front suspension and spring rear suspension, which is ideal for a cruiser-segment motorcycle. The Renegade Commando will be available at Rs 1.69 lakhs (ex-showroom, Bengaluru). The Renegade Sports S model will also share the same engine as the Renegade Commando. The Renegade Sports S was much appreciated when it was showcased at the 2015 EICMA in Milan. The Renegade Commando and its sibling Renegade Sports S come with an electric start. An innovative feature called Service Alert Maintenance comes as a standard fitment in both Renegade Commando and Renegade Sports S. The LED Lights come as a standard in Sports S version. Six-speed synchronized mesh has been added for easy cruising. The front wheel has telescopic suspension while the rear wheel has dual shock absorbers. These motorcycles have a fuel tank of 18 liters with a kerb weight of 172 Kg. The Renegade Sports S is available at Rs 1.59 lakhs (ex-showroom, Bengaluru).